Did you know that Elkhorn Ranch has a guided hiking program? It adds another dimension to your Arizona dude ranch vacation experience at Elkhorn Ranch. Try a relaxed hour or so long stroll on easy flat trails, or climb high into the rugged Baboquivari’s with a lunch for an all day rugged adventure. There are options to fit everyone’s fitness level and interests. Guided hikes add another dimension to your Arizona dude ranch vacation experience at Elkhorn Ranch. Guests are always welcome to hike independently, but people find that hitting the trails with our hiking guide helps them see country they wouldn’t find on their own. Many of you know our hiking guide, Craig Errazuriz. He is an 18 year veteran ranch crew member, who spent years walking and running the Elkhorn’s horse trails during his free time. Along the way, he invested in training to be a professional fitness coach, and worked with people of all ages and fitness levels at a cross-fit gym in Tucson. He is CPR / First Aid certified and always carries first aid supplies, extra water and a radio. 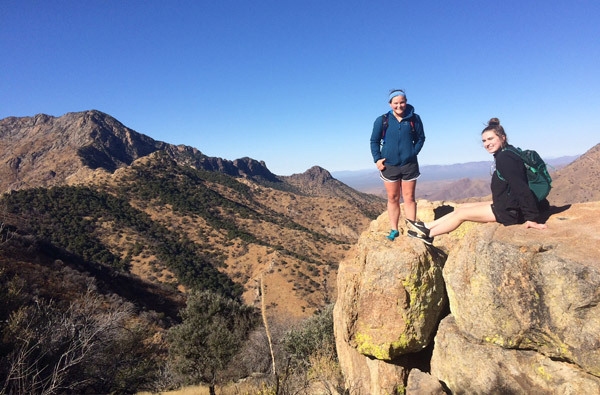 Over the holidays, teens fresh off fall sports training summited Red Mountain. Craig and their parents made the trek as well! Recently a 70 year old guest, who’s been coming to Elkhorn for over 25 years to ride and rendezvous with friends, found herself wary of riding due to a back injury. She doesn’t consider herself a hiker, but gave it a try and to her delight said, “I feel like I’ve been riding!” She even lured her husband off a horse to hike with her! Horseback guides lead from the front of the riding group, but Elkhorn’s hiking guide pays the most attention to those at the tail end of the group who might some extra help on the trail. Don’t be shy about adding a guided hike to your dude ranch vacation experience! There are even walking sticks and backpacks to borrow in the ranch lending closet. Hiking ventures are planned Monday-Friday from the ranch office! Check out more hiking photos in the Hiking Gallery.